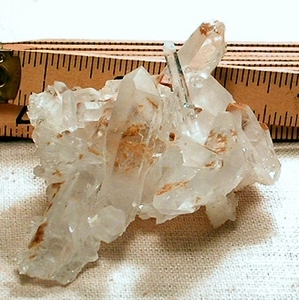 Tan chlorite inclusions and rare phantoms show off in this brilliant, glass bottom Arkansas rock crystal cluster. 2 1/4x 3 1/2x 2", there are also very rare white titantium phantom tips! Great after-calcite base covered partially in sparkling drusy. Twin crystals, tabulars, penetrators, doubly-terminated crystals, rainbows and some natural etching - great piece.